A very few times we come across a book that make us whisper to ourselves that its legendary. 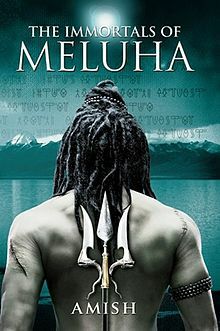 Authored by Amrish Tripathi , Immortals of Meluhas is part 1 of the Shiva Trilogy. The book is a work of Fiction where the author has sensed the plot on the concept that what if Load Shiva was born as Human being and his deeds made him God. Set in 1900 B.C, Shiva, a tribal leader in Tibet near Mount Kailash on the banks of Mansarovar lake, is invited by Nandi, the Captain of Meluha to migrate with his tribe to their lands. Fed-up with the barbarian life of the tribes in the region,Shiva decided to move to Meluha which was considered to be near-perfect Kingdom. Meluha was part of ancient India which was setup by the Lord Ram, the greatest King ever. He established Meluha as Suryavanshi Kingdom with codes and conducts of the society which were the pillars of Meluha Kingdom. Suryavanshis believed in the Legend of Neelkanth (Blue Throat), which said that the Lord will come from Foreign land and will lead Meluha in the war against evil. When Shiva’s throat was converted into blue after consuming Somras (a divine drink which leads to Immorality), Shiva was renamed as Load Shiva and he led them to the war against Chandravanshis who had allied with the forces of Nagas which was considered to be cursed groups. After the war, Shiva realizes that his choices actually reflected what is aspired to be. The search of evil which made him to war with Chandravanshis but he found that to find real evil, he has to go for the greater journey. The book is very fast paced and is very well coordinated with the hindu mythology. There are so many mystic characters and wonderful twist and turns. You think that you are witnessing the making of Indian version of Game of Thrones and even Lord of the Rings. Also you can find parallelism with Paulo Cealho’s writing style of mixing mythology with fiction. Language of the book could have been better but however its simple enough to be loved by every one. The plot of the book is awesome and it can create an amazing motion picture but sadly the rights of the book is taken by Mr. Karan Johar . I hope he doesnot make a movie called “God of the Year” and make them drive Ferraris . I have also reviewed two books till date..Read those from review store.. I think so its a good idea to buy the complete series when “The Oath of Vayuputras” releases. It would be nice to read it back-2-back-2-back. Went through your reviews, they are neat. Well Done !! My name is Clark Prasad, author of Baramulla Bomber – a techno mythology thriller. I wanted to request if you could review my book Baramulla Bomber (eka of Svastik trilogy). The book trailer link is: http://www.youtube.com/watch?v=wqrRUPJqae8 and its Goodreads page link is: http://www.goodreads.com/book/show/18222163-baramulla-bomber. Please do also have a look at my website, http://www.clarkprasad.com. Thank you for your time to read this post.